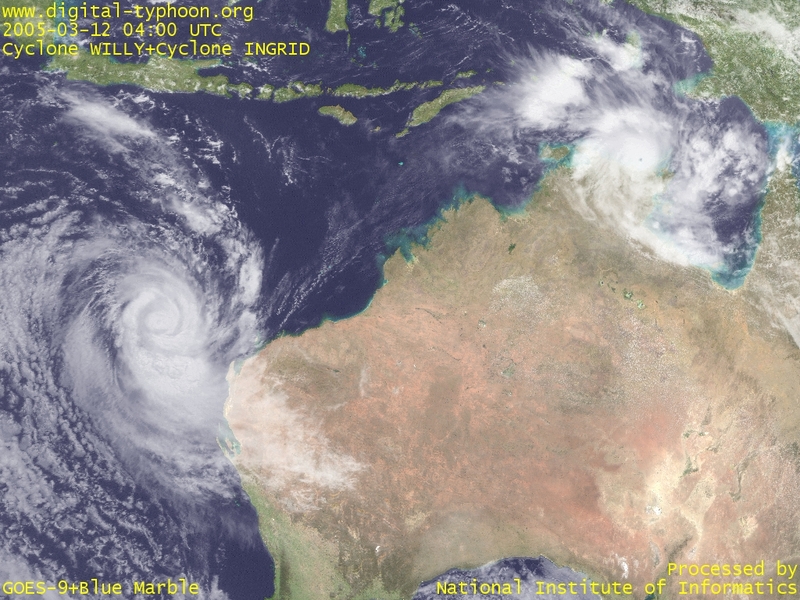 Cyclone INGRID survives to the last moment. It has weakened to the central pressure of 968hPa (Category 3), but its cloud system is still well organized. The track so far has been relatively close to the coast, so if it turns a little north and reaches open water, it has good momentum to revive itself again. 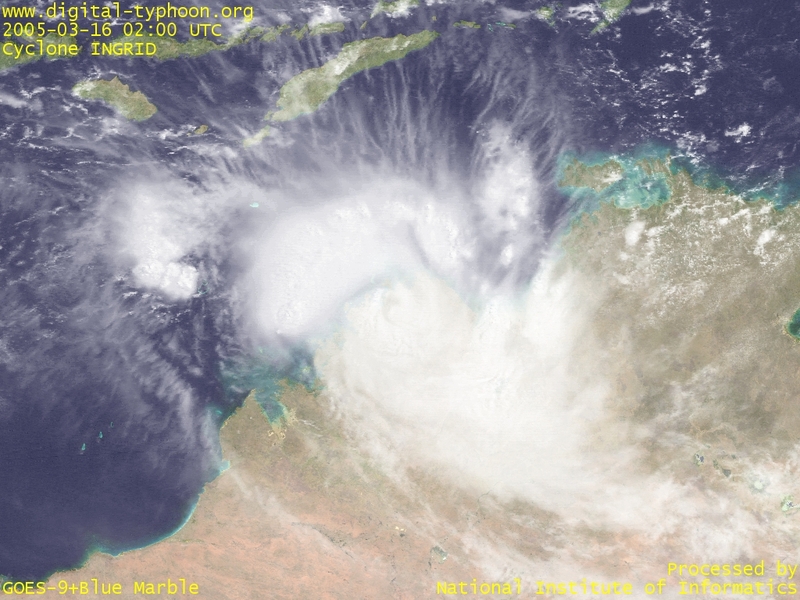 Cyclone INGRID is now moving on Western Australia, and it is reported that the remote resort of Kimberley, hit directly by the cyclone, had severe structural damage. 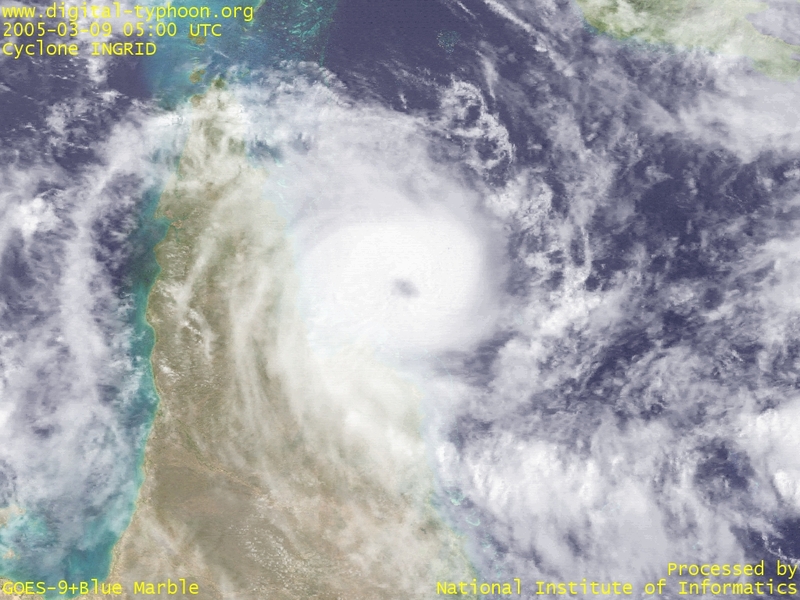 Cyclone INGRID has once again recovered its strength and intensified with the central pressure of 945hPa (Category 4). Its track, however, is getting more southward, so it will make landfall on the mainland in a short time, terminating its life of ups and downs. In the evening the cyclone has once again reached the maximum intensity of 935hPa (Category 5). This cyclone really has a charmed life. Radar images above show the cyclone which seems to be just after making landfall, observed the radar at Wyndham. 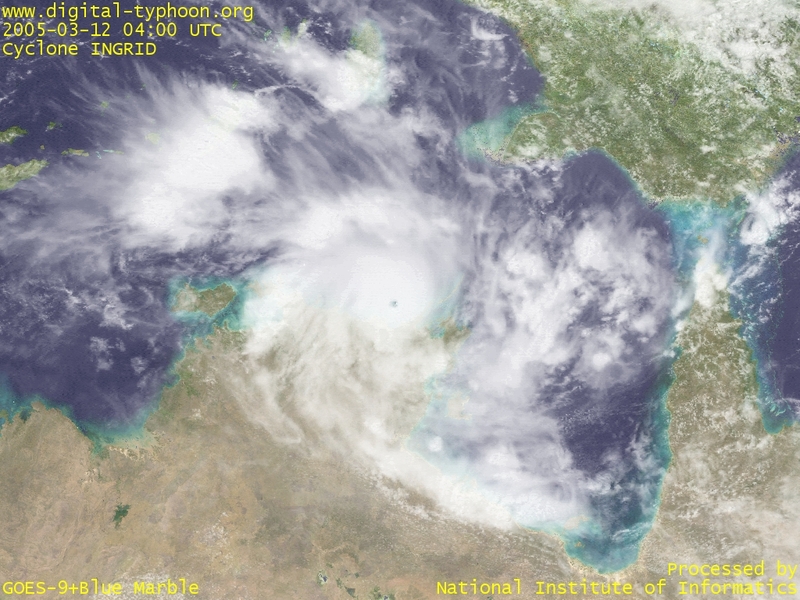 Cyclone INGRID has weakened into Category 3, but now it maintains its strength without signs of rapid weakening, partially because the cyclone is now moving over open water, the Timor Sea. The meteorological satellite image today still shows the presence of the eye. As the cyclone passed, severe structural damage has been reported from remote islands in north of Darwin, but what people in the mainland Australia really feel seems to be that they wished to have more rain from the cyclone. 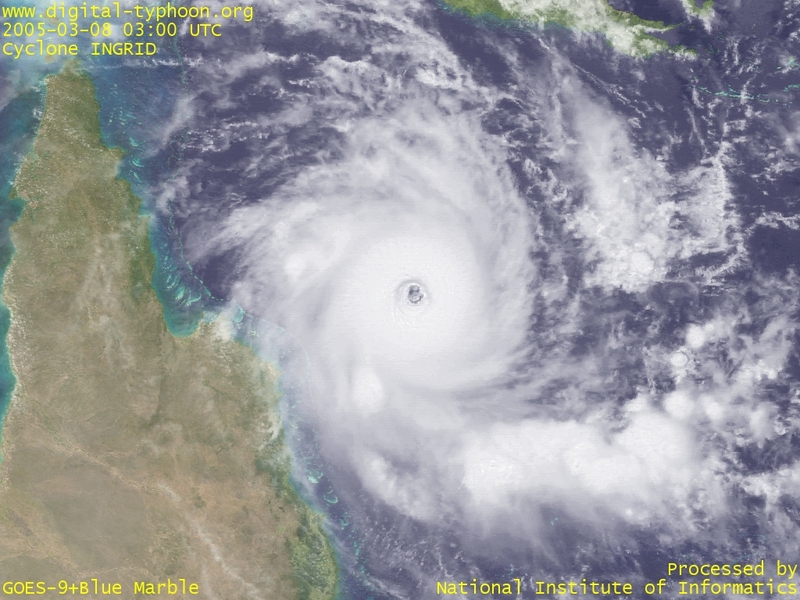 Cyclone INGRID has intensified to the central pressure of 925hPa (Category 5) with the maximum wind gusts of 320km/h, and reached its peak maturity during its lifetime. It is lucky that the very destructive core of the cyclone is moving over the sea, and it seems no major damage has been reported. But the capital of the Northern Territory, Darwin, is now on the highest cyclone warning alert and prepares for the cyclone. Afterwards, Cyclone INGRID reached the area of Cobourg Peninsula, and has weakened into Category 4. The cyclone's expected track passes near Melville island, and it is likely that the cyclone will weaken due to its movement over the land. 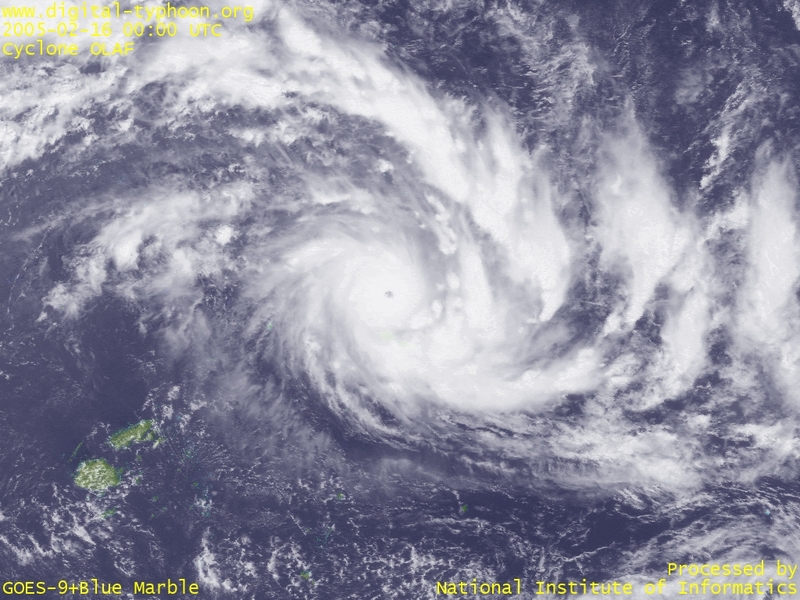 According to radar images provided from Bureau of Meteorology, the cyclone has weakened compared to the peak intensity yesterday, and although the eye is still present, the overall structure of clouds is getting smaller. 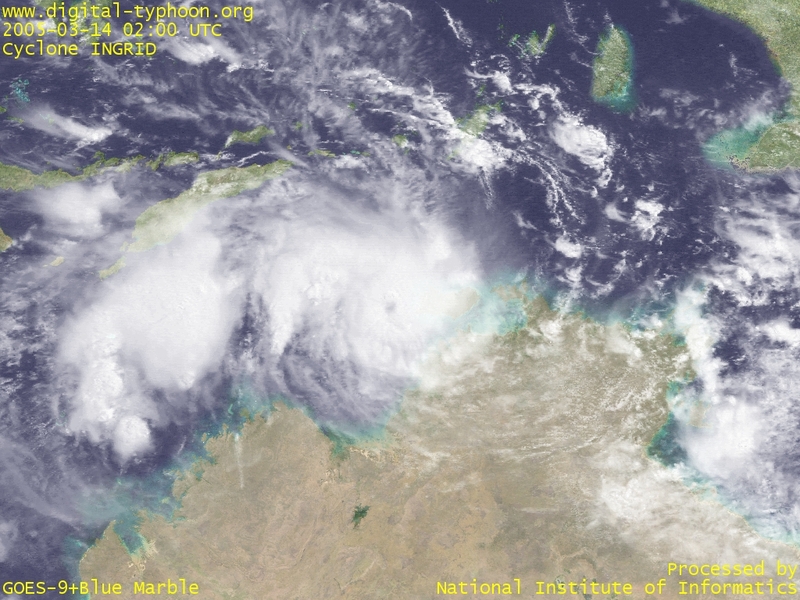 The cyclone is located a little far from the capital, Darwin, but a band of clouds extending from the cyclone is bringing heavy rainfall on the mainland. 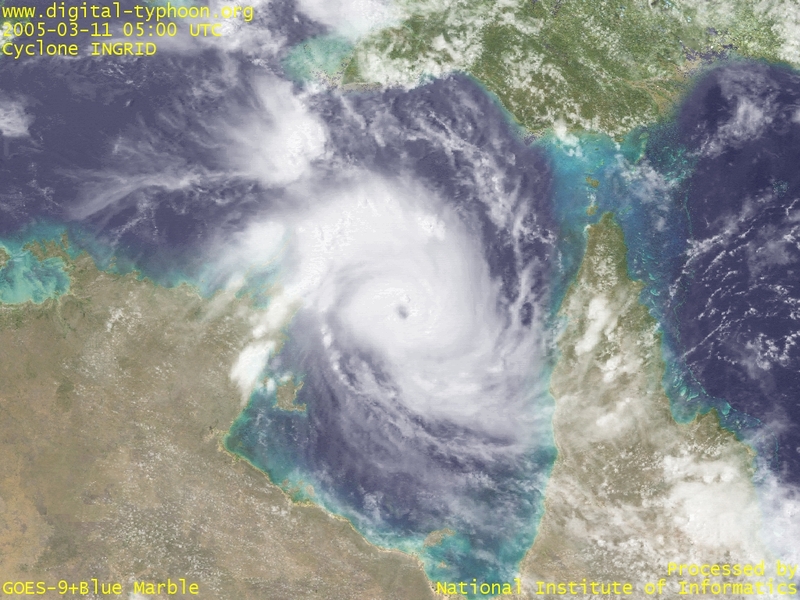 Cyclone INGRID has once weakened into the central pressure of 992 hPa (Category 1), but it completely recovered over the warm Gulf of Carpentaria, re-intensified as strong as the central pressure being 938hPa (Category 5), according to the Bureau of Meteorology, Australia. The eye of the cyclone is clearly recognizable on radar images above observed at Gove, Northern Territory. 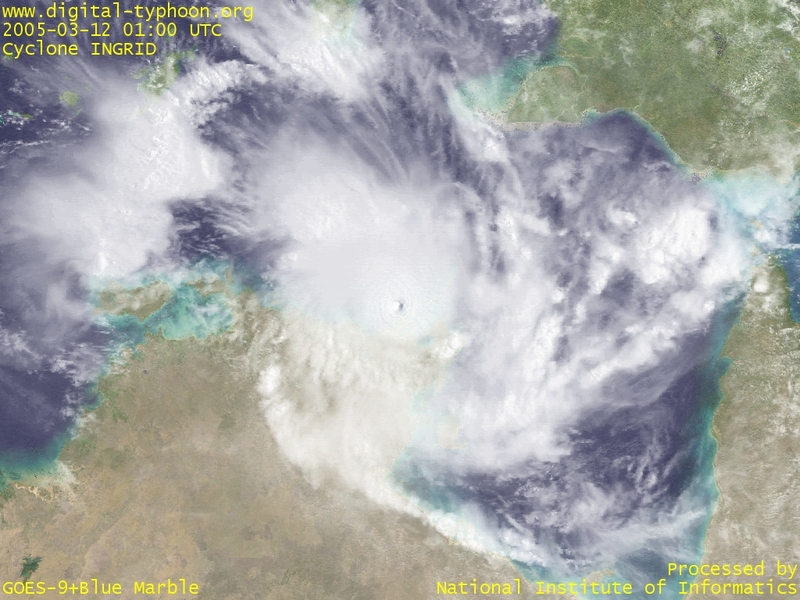 The other cyclone, WILLY, is a big cyclone, but its cloud system is not well formed compared to Cyclone INGRID, and it looks it will not gain more strength and start to weaken. The term "willy willy" has been used for tornadoes and even tropical cyclones but its main use is for dust devils. 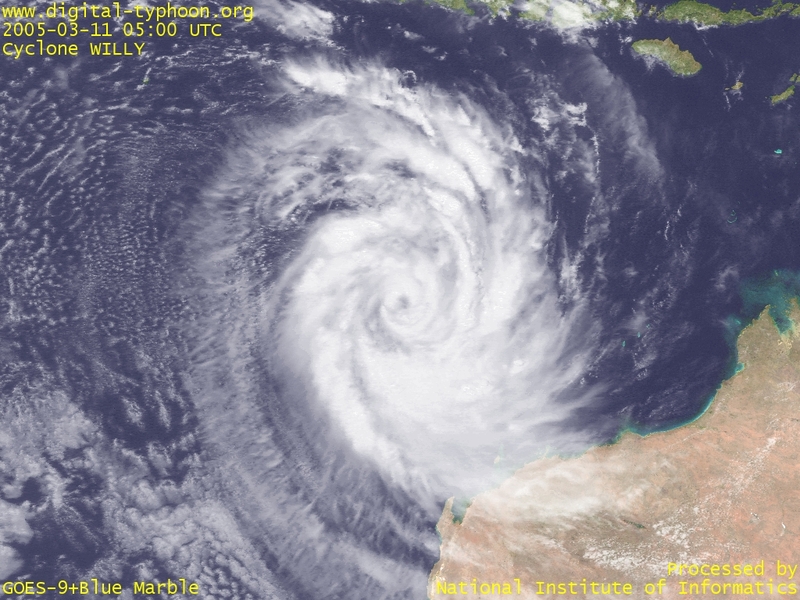 in western Australia, any large, travelling tropical cyclone. So this misunderstanding seems to linger for a while in spite of the fact that Willy-Willy is actually not being used in Australia to refer to tropical cyclones. Detailed discussion. 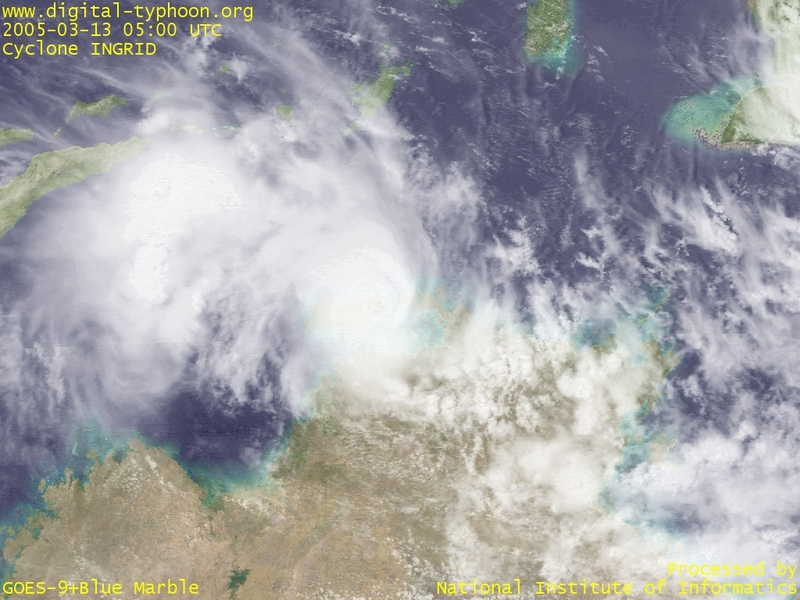 Cyclone INGRID is just moving across Cape York Peninsula. 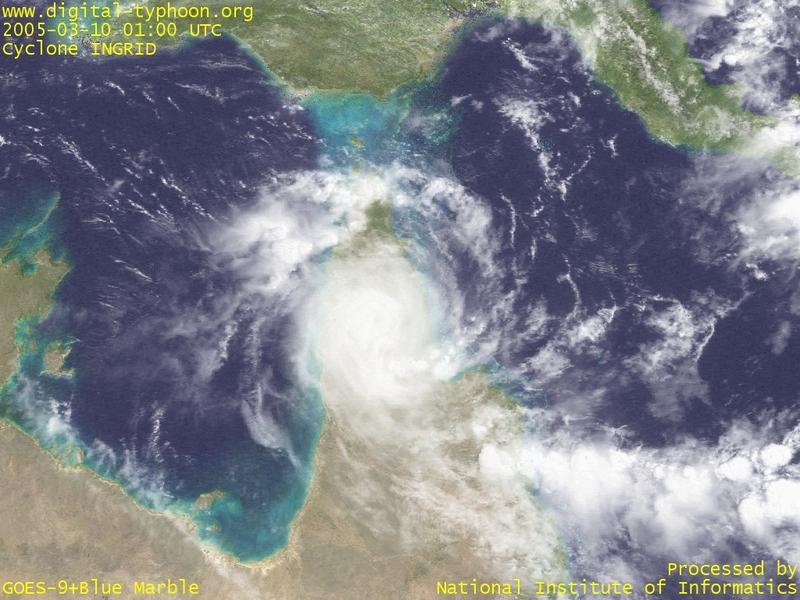 It has weakened significantly from its peak maturity, but it still keeps its well-rounded shape, and it may indicate re-intensification after it reaches the Gulf of Carpentaria. 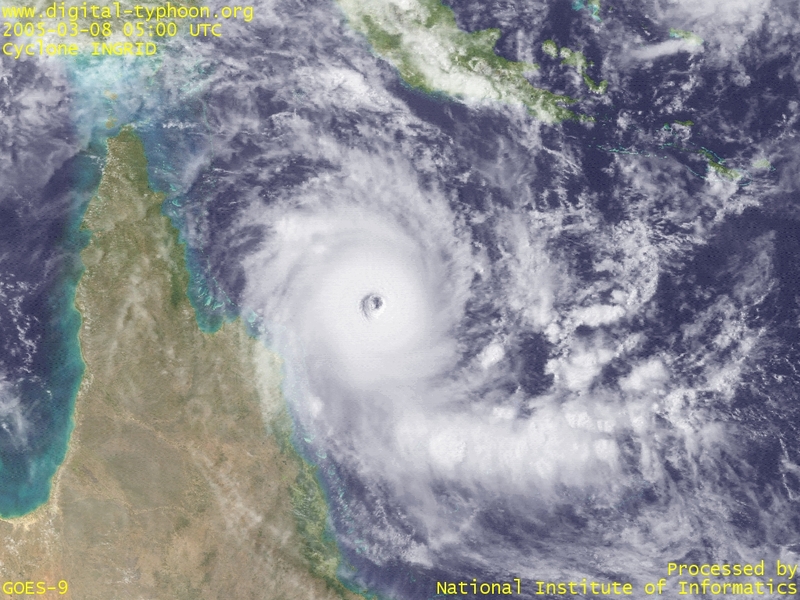 Another cyclone, Cyclone Willy, was generated in the Timor Sea in north-west of Australia. According to JTWC, it is forecast to move westward to the Indian Ocean, so it is likely to give little impact on the mainland Australia. 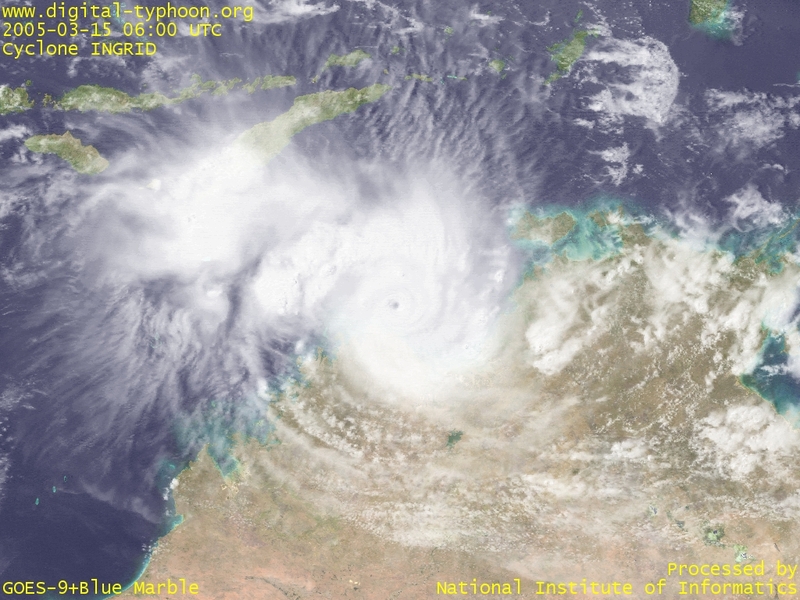 Cyclone INGRID has weakened a little, and downgraded into Category 4, but it still keeps a strong intensity that has rarely be seen in Coral Sea. According to The Bureau of Meteorology, Australia, the central pressure is 935hPa and the maximum wind gusts are 280km/h (0700 EST). It seems that the cyclone is moving a little northward, so the effect of the cyclone may be smaller than expected around Cairns. 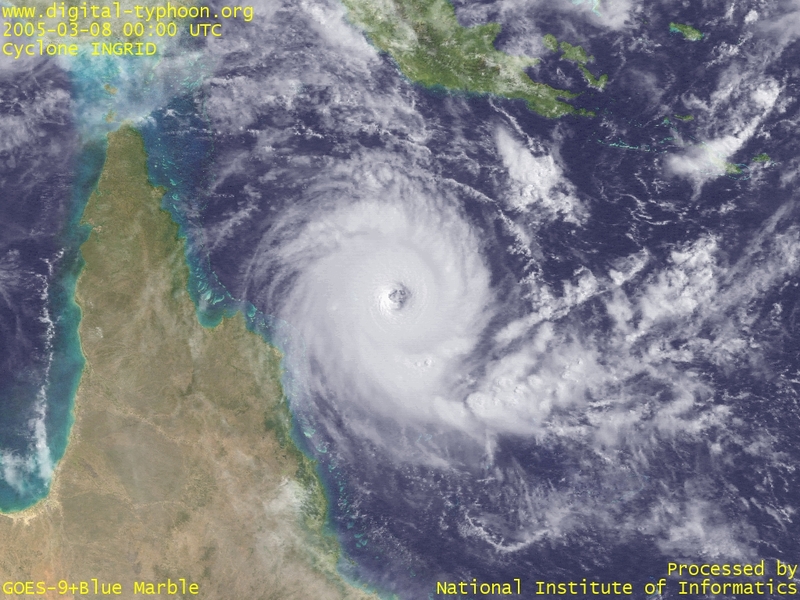 Among tropical cyclones that made landfall on the mainland Australia, this cyclone may become the strongest cyclone since Cyclone TRACY that hit Darwin in 1974. Related information : Cyclone Tracy. 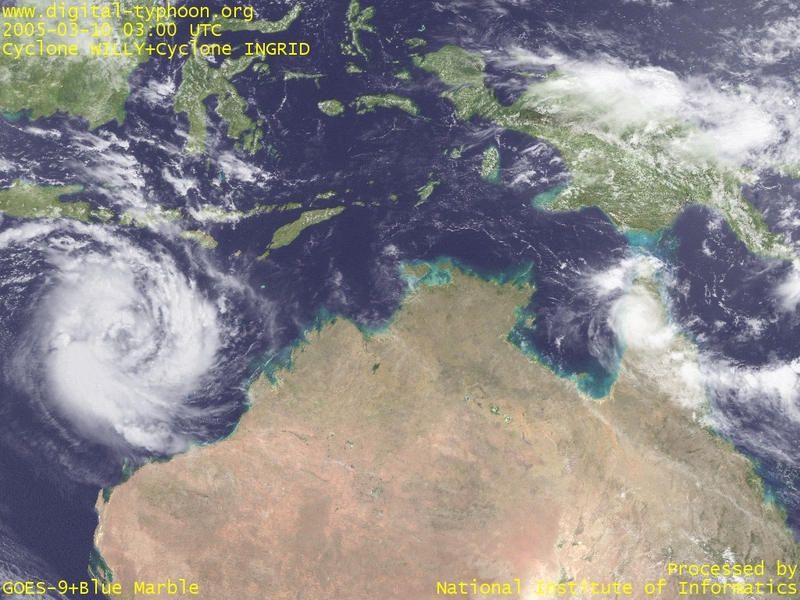 Cyclone INGRID is approaching to the north Queensland coast, Australia. The forecast of maximum wind is 135kt, according to the forecast of JTWC, and it will draw near to north of Cairns. The Bureau of Meteorology, Australia says the central pressure is 930 hPa (Category 5), and the maximum wind gusts are 290 km/h (1000 EST). 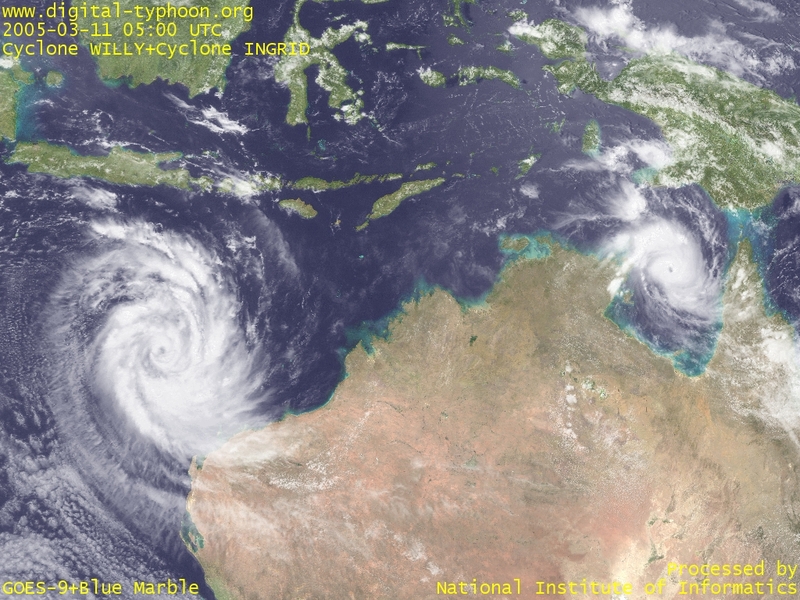 The mainland of Australia recorded only two category-5 cyclones in over 100 years, which fact indicates that this cyclone is a devastating cyclone at present. The cyclone number by JTWC is 22P, and the satellite image below reminds me of the typhoon of the identical number, Typhoon 200422, which was also a small-sized but well-developed typhoon. The tropical cyclone of this type has very strong winds near the center. 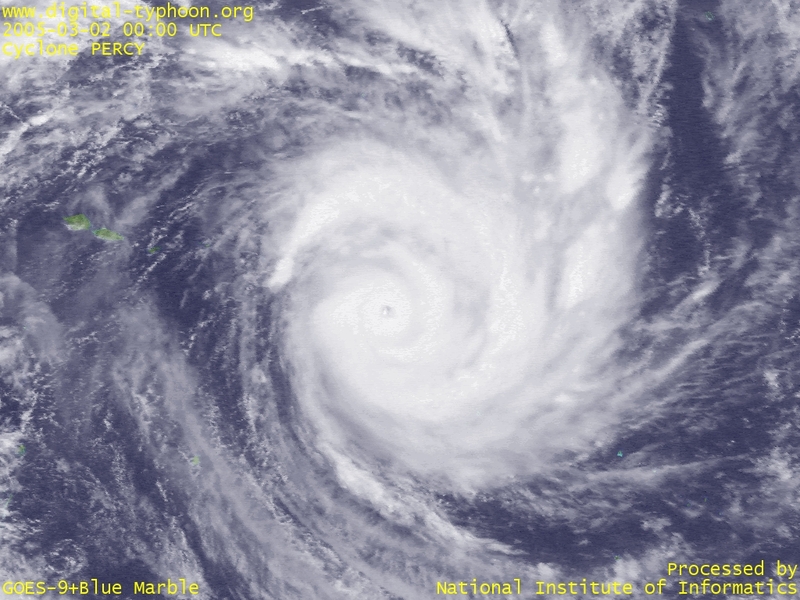 This cyclone season in the southern Pacific basin has seen intense cyclones in a row. After Cyclone MEENA (Max. Wind 125kt), strong cyclones such as Cyclone OLAF (Max. Wind 145kt), Cyclone NANCY (Max. Wind 125kt), and Cyclone PERCY (Max. Wind 140kt) have been generated one after another. In particular, Cook Islands suffered from the four successive strikes of cyclones, by which some islands and atolls within the area were severly damaged. 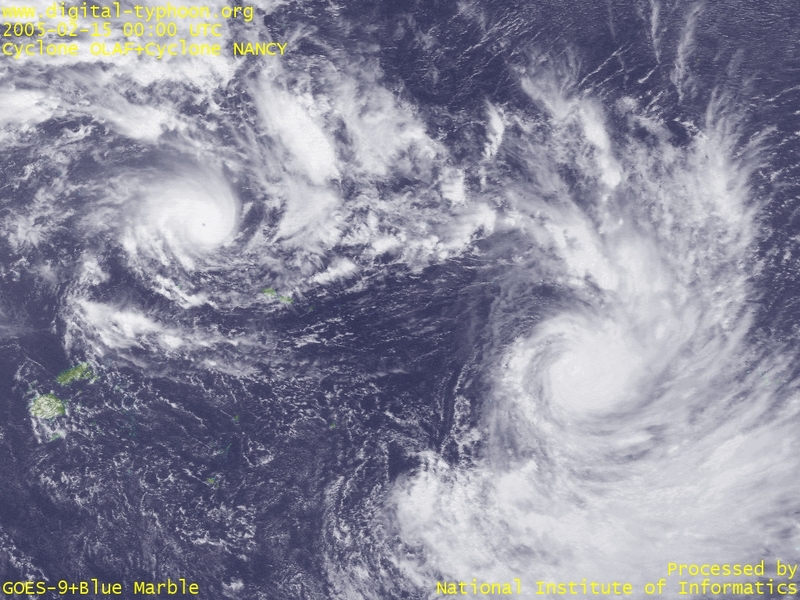 And as the image below shows, two cyclones, Cyclone OLAF and Cyclone NANCY, were generated within a very short distance, and it is said that two cyclones of so small distance is a rare event in this area of southern Pacific. Definitive opinions cannot be expressed due to the lack of good databases, but this and other facts may be an indication that the cyclone activity of this year is more intense than average. The succesive intensification of tropical cyclones is reminiscent of Typhoons in 2004 within North Western Pacific. Satellite images of Cyclone INGRID by NASA. Satellite images of Tropical Cyclone PERCY by NASA. Satellite images of Tropical Cyclone OLAF and Tropical Cyclone NANCY by NASA.